Christopher Leonardi, Ph.D., is a Lecturer within the School of Mechanical and Mining Engineering. His research effort in this post, in collaboration with some of the world's largest oil production and services companies, is currently targeted at the development of large-scale numerical models which can be used to provide insight into the complex characteristics of multiphase fluid flows in oil and gas reservoirs. This has included the creation of a computational framework which uses micro-CT images of core samples and a range of numerical methods to determine the permeability of reservoir rocks, and the combination of non-Newtonian fluids and suspended particles to simulate the behavior of proppants in hydraulic fractures. Projects in the immediate future will include capturing the behavior of thin films in simulations of multiphase flows in porous media as well as the transport of methane in low porosity shale. 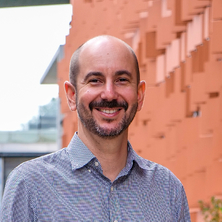 Dr. Leonardi's general research interests include, in addition to multiphase flows, computational modelling of fluid-structure interaction (i.e. particle suspensions) with non-Newtonian fluids, and high performance parallel computing using shared memory multicore architectures. Particular fields of expertise include the lattice Boltzmann method (LBM) for fluid flows, the discrete element method (DEM) for discontinuous systems, and the finite element method (FEM) for solid mechanics problems. Jones, B. D., Williams, J. and Leonardi, C. R. (2015). Simulation of particle suspensions using a coupled lattice boltzmann and discrete element method. In: 49th US Rock Mechanics / Geomechanics Symposium 2015. 49th U.S. Rock Mechanics/Geomechanics Symposium, San Francisco, CA, United States, (2307-2311). 29 June - 1 July 2015. Leonardi, Christopher R., Jones, Bruce D., Holmes, David W. and Williams, John R. (2013). Simulation of complex particle suspensions using coupled lattice Boltzmann-discrete element methods. In: Graham Mustoe, DEM 6: Proceedings of the 6th International Conference on Discrete Element Methods and Related Techniques. 6th International Conference on Discrete Element Methods (DEM6), Golden, CO, United States, (1-8). 5-6 August, 2013. Tilke, P. G., Leonardi, C. R., Holmes, D. W. and Williams, J. R. (2012). A multicore numerical framework for assessing the permeability of reservoir rocks. In: 4th International Conference on Porous Media and Their Applications in Science, Engineering and Industry (ICPM 2012), Potsdam, Germany, (). 17-22 June, 2012. Leonardi, Christopher, Holmes, David W., Williams, John R. and Tilke, Peter G. (2011). A Multi-Core Numerical Framework for Characterizing Flow in Oil Reservoirs. In: Layne T. Watson, Gary Howell, William I. Thacker and Steven Seidel, Proceedings of the 19th High Performance Computing Symposium. 19th High Performance Computing Symposium (HCP2011), Boston USA, (166-174). 4-7 april, 2011. Leonardi, Christopher, Owens, D.R.J., Feng, Y.T. and Ferguson, W.T. (2008). Computational modelling of fines migration in block caving operations. In: Håkan Schunnesson and Erling Nordlund, Proceedings of the 5th International Conference and Exhibition on Mass Mining (MassMin2008). 5th International Conference and Exhibition on Mass Mining (MassMin2008), Lulea, Sweden, (). 9-11 June 2008. Owen. D. R. J., Feng, Y. T., Han, K. and Leonardi, C. R. (2007). Multi-field coupling strategies for large scale problems involving multi-fracturing rock and particulate media. In: 3rd Asian-Pacific Congress on Computational Mechanics (APCOM07), Kyoto , Japan, (). 3-6 December 2007. Loughran, J.G. and Leonardi, Christopher (2005). Application of discrete element methods to modelling of belt feeders. In: Mike Xie, Advances in applied mechanics : proceedings of the fourth Australasian Congress on Applied Mechanics. 4th Australasian Congress on Applied Mechanics (ACAM05), Melbourne , Australia, (119-124). 16-18 February 2005.